One of our projects in Scottland came in September 2011 to an end. Our Customer Carron Phoenix improved from a defect level of 4% to 0% in 4 month. The service level increased. These results led to further savings along the value stream. The sales companies saved a few hundred thousand Euros on (safety, buffer stock) inventory reduction, logistics (not sending back goods), rework, goods entry check efforts, service and warranty costs, not to mention the reputation and marketing side effects. Lean audits, continuous lean education, value stream mapping, defining interfaces and standardization of processes (SOPs) and documentation was one part of the success story. The other part was to address the hidden inter-company topics. Establishing a common and mutual understanding between the parties involved, touching the key problems and hidden agendas. Carron Phoenix is a great Scottish company with a long history and staff understanding the lean journey. It was a pleasure to see change happen and getting this mutual buy-in. 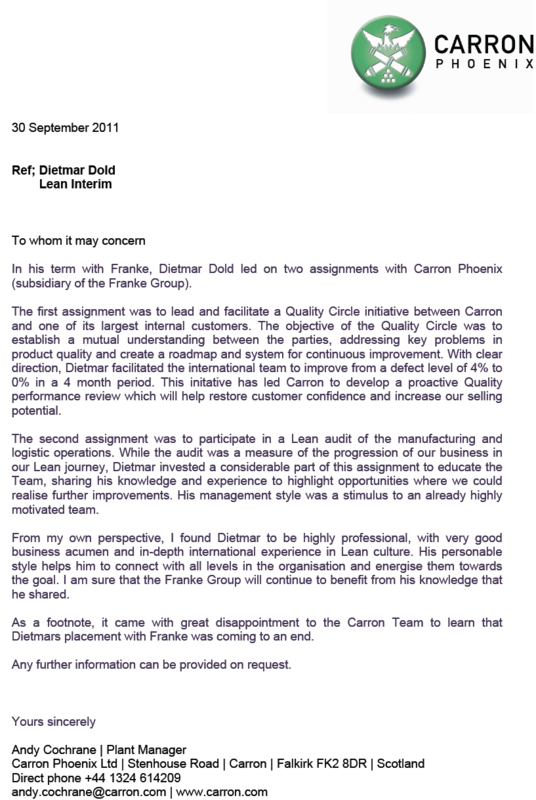 In his term with Franke, Dietmar Dold led on two assignments with Carron Phoenix (subsidiary of the Franke Group). The first assignment was to lead and facilitate a Quality Circle initiative between Carron and one of its largest internal customers. The objective of the Quality Circle was to establish a mutual understanding between the parties, addressing key problems in product quality and create a roadmap and system for continuous improvement. With clear direction, Dietmar facilitated the international team to improve from a defect level of 4% to 0% in a 4 month period. This initative has led Carron to develop a proactive Quality performance review which will help restore customer confidence and increase our selling potential. realise further improvements. His management style was a stimulus to an already highly motivated team. As a footnote, it came with great disappointment to the Carron Team to learn that Dietmars placement with Franke was coming to an end. Any further information can be provided on request.